Christopher Matthews and Elizabeth Teague were married on 22 January 1793 at St Dunstan’s, Stepney. Christopher was the son of John and Mary (Garth) Matthews and father of James Matthews the banker. John Teague is a witness. We know only a little about the Teague family. 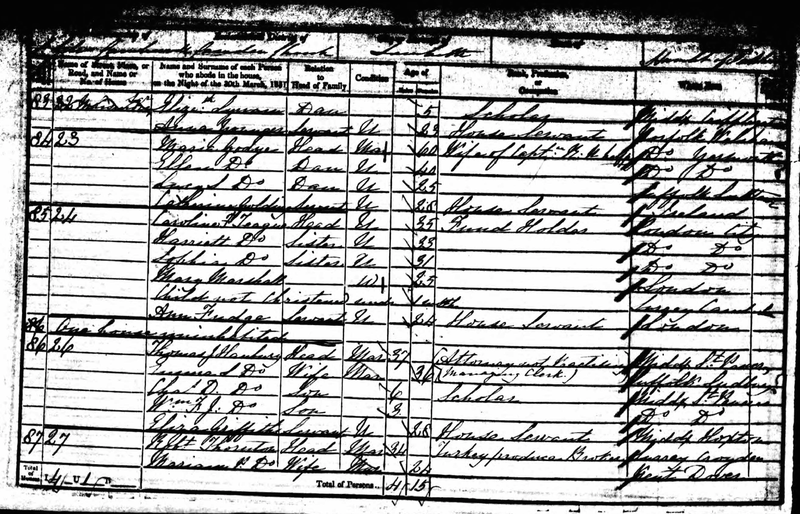 On the 1851 census Harriet Teague aged 29 is visiting the James Matthews household at Crayford in Kent. Her place of birth is given as St. Sepulchre. However there are issues with the census. First, Harriet’s age is given as 29 which would make her date of birth 1822; but on the 1841 census her age is given as 25 making her date of birth 1816. Perhaps vanity had got the better of Harriet by 1851. Second, the transcriber indicates that she is married but so is the 18 year old Sarah Matthews when she was not. 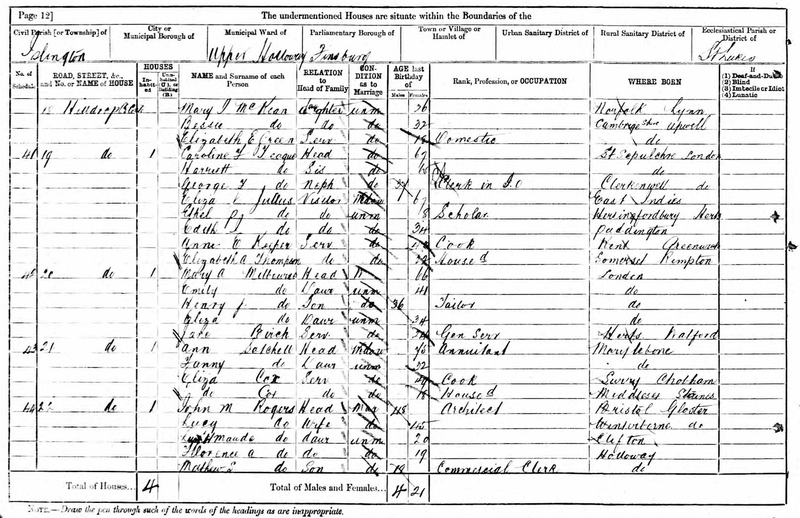 Below is the James Matthews family on the 1851 census with Harriet as a visitor. 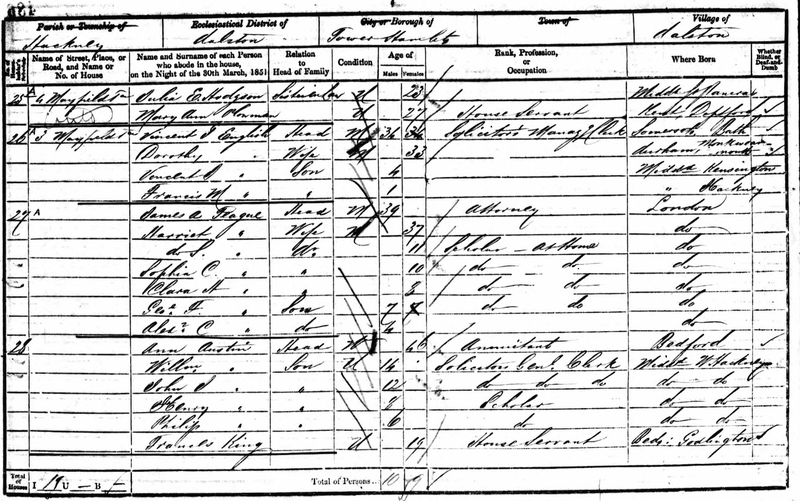 On the 1841 census Harriet Teague, aged 25, is residing in St. Sepulchre parish where her father, John Teague, is Governor of Giltspur Street prison. Also, residing at Giltspur are her two sisters. It is likely then that Elizabeth (Teague) Matthews is related to the John Teague governor of the Giltspur street prison and his daughters. But how exactly? We know that this John Teague’s father (also John) was, like his son, a prison governor and it is probable that John senior was Elizabeth Teague’s brother. 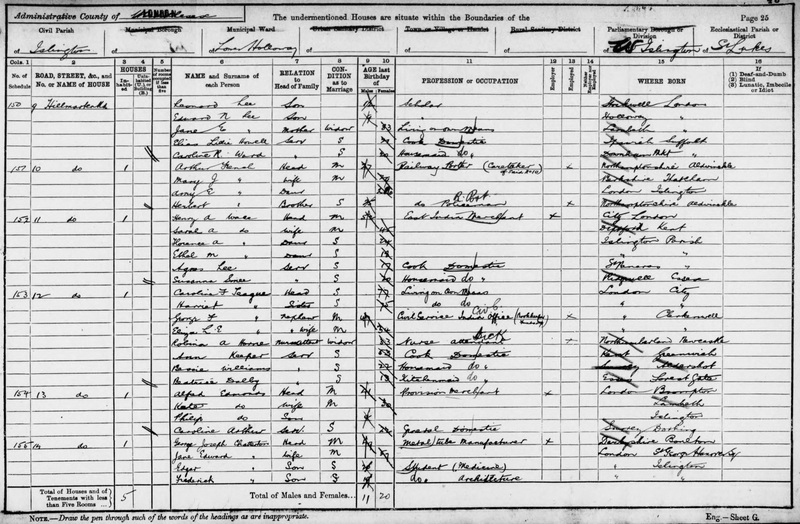 Thus on the 1851 census Harriet was visiting her second cousins, the children of her great aunt Elizabeth (Teague) Matthews. 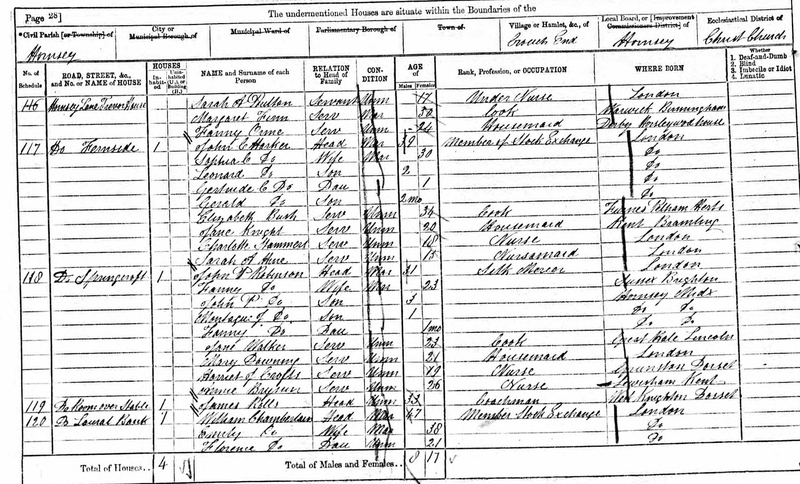 Below is the Teague family on the 1841 census residing at the Governor’s quarters of the Giltspur prison. The family is listed first and consists of the head of the household John Teague, (aged 60) with his three daughters: Caroline Frances (25); Harried (25) and Sophia. There then follow the domestic servants, the prison staff, and a list of prisoners with their occupations. Giltspur was a debtors’ prison and so the occupants (tailors, surveyors, bakers, postmen, cabinet makers) were considered a more ‘polite’ sort. Quite a few are only 15 years old. Sophia, b. 23 Dec 1817; d. (unmarried) 25 Jul 1851. In February 1852 James died and his wife Harriette died in September that same year leaving their children orphans. Sophia Caroline, b. 21 Aug 1840; married John Cooke Harker; d. 1878. Alexander Crichton Teague, b. 28 Dec 1846. Died 1856 aged 10 years. The children of Sophia Caroline Teague and John Cooke Harker are listed below under ‘Harker Family’. July 17. Mr. Teague the governor of the Giltspur-street Compter. 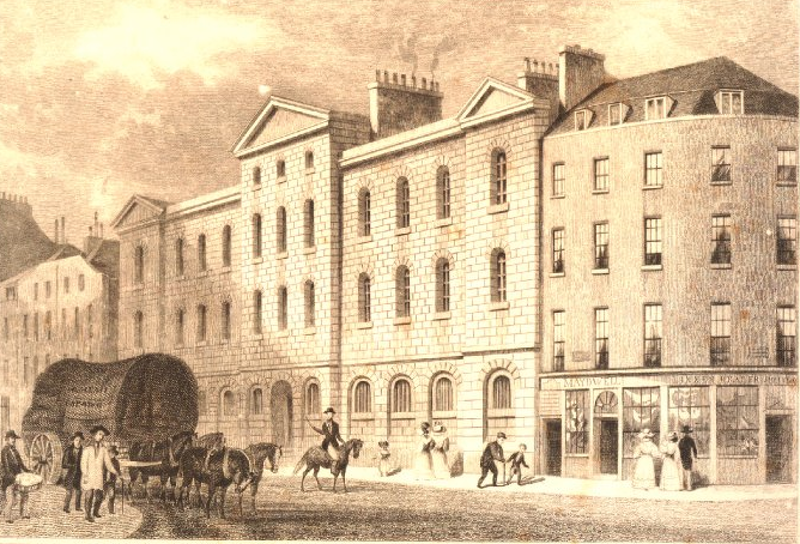 He succeeded his father at the Poultry Compter on the 26th April, 1803, and was appointed to Giltspur-street Compter and Ludgate (then debtors’ prisons) on the 25th Sept. 1804, and to the House of Correction in Dec. 1815, on the removal of the debtors from Giltspur-street and Newgate to the new prison in Whitecrossstreet, and the removal of the House of Correction prisoners from Newgate to Giltspur-street. 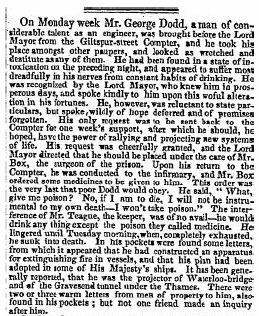 His father was appointed keeper of Ludgate in January, 1793, and removed to the Poultry Compter in 1801. Mr. Teague was a man of remarkably amiable and mild disposition. 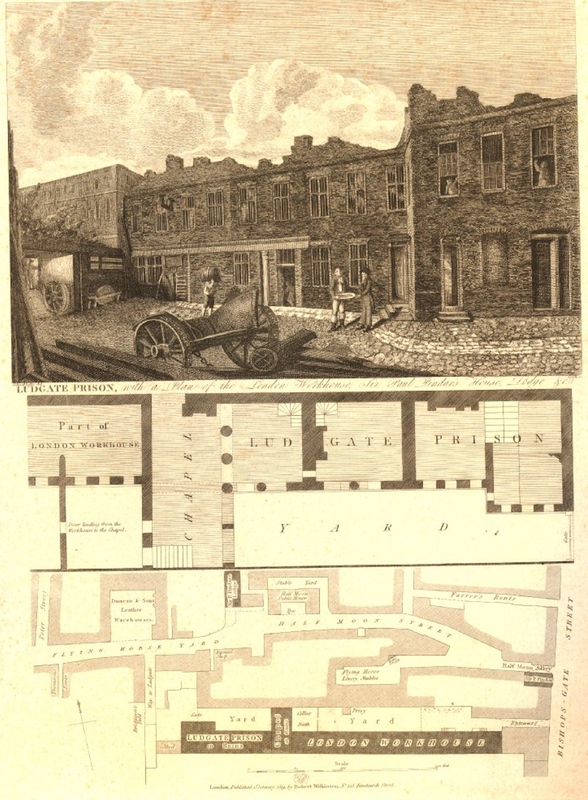 Giltspur-street Compter, or the City House of Correction, was built by George Dance, in 1791, to supersede the wretched prison in Wood-street, whence the prisoners were removed in 1791 : it was then only used for debtors, but subsequently for remands and committals for trial, and minor offenders. The rear of the prison abutted on Christ’s Hospital, and its towers are visible from the yard : the happy shouts of the boys at play were heard by the prisoners, and the balls often fell within the prison-yards, as if to remind the fallen inmates how much innocence they had outlived! In 1808 Sheriff Phillips described Giltspur-street, with its corner, entitled “Ludgate” (for citizen debtors, clergymen, proctors, and attorneys), and the whole prison, as greatly overcrowded by the removal to it of the Poultry Compter debtors. The solitary confinement was in front of the building, where, however, the prisoners could see the busy street, and the crowds to witness executions in front of Newgate. 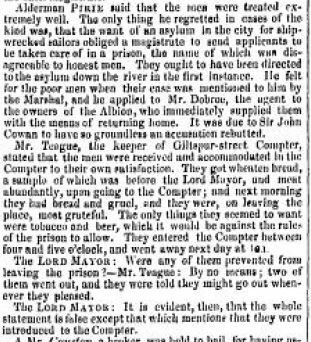 About 6000 prisoners were annually committed to Giltspur-street ; but it was one of the worst managed and least secure of the metropolitan prisons, and the escapes from it were the most frequent. 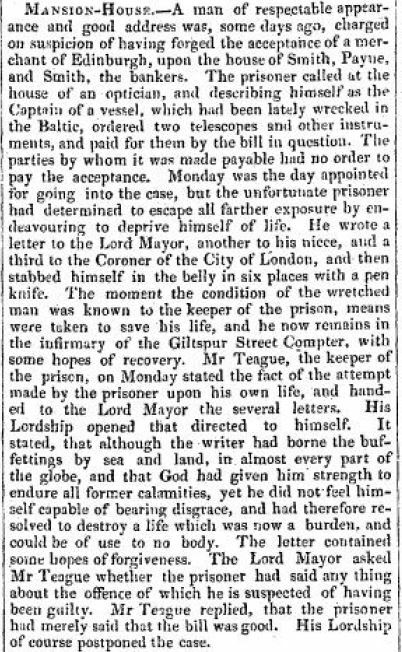 As a proof of the lenity of its management, it is related that, on the death of Mr. Teague, the humane governor of Giltspur-street Compter, in 1841, nearly every prisoner wore a black crape hat-band! The prison was closed in 1854, when the keeper had a retiring allowance of 300 a year : it has since been taken down. The accounts of Receipts and Disbursements of this prison are kept with great accuracy : and the order and decorum observed in it do much credit to Mr. Teague, the keeper. (From An Account of the Rise, Progress and Present State of the Society… by James Neild). 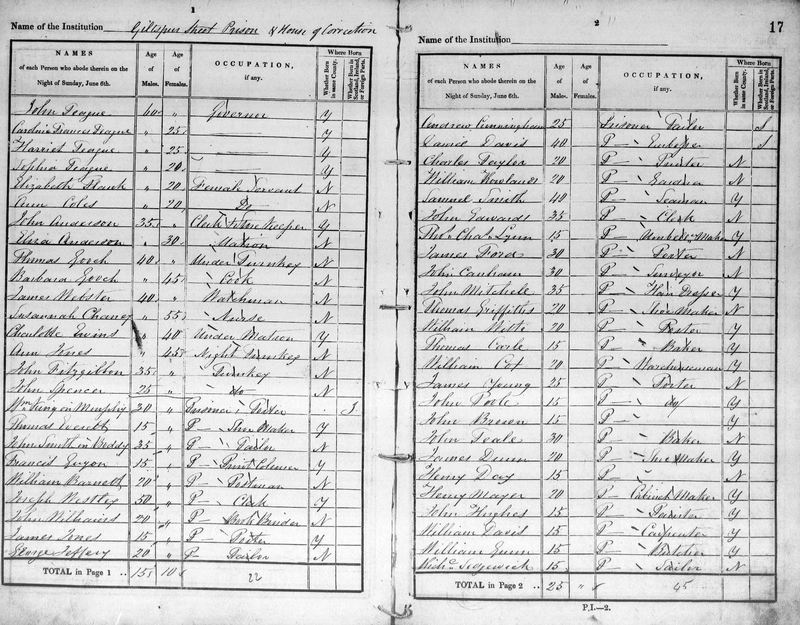 Although Harriet appears with her Matthews family relatives on the 1851 census, she also appears on the same year’s census with her sisters in Lambeth. The census was intended to be a spot count at one instant. This was made clear in the instructions to enumerators and participators. However on occasions repeated calls were made by enumerators to collect outstanding schedules, this could drag on for many days as people had a habit of taking the schedules away with them on their travels. In Harriet’s case she may well have been at the Matthews (and was counted there) but her own family felt (since she was not at the time with them) it better to count her among them just in case. It could also have been possible for Harriet to have traveled from one location to another and to have been counted more than once, but this unlikely given the way the census was conducted. Searches through London records of all types have only revealed this one Harriet Teague so we believe despite her double appearances on the 1851 census and the discrepancies in her age, 29 with the Matthews, and 33 with her sisters, we are dealing with one and the same person. Below the 1851 census showing the three unmarried Teague sisters in Lambeth: Caroline (35), Harriet (33), and Sophia (31). 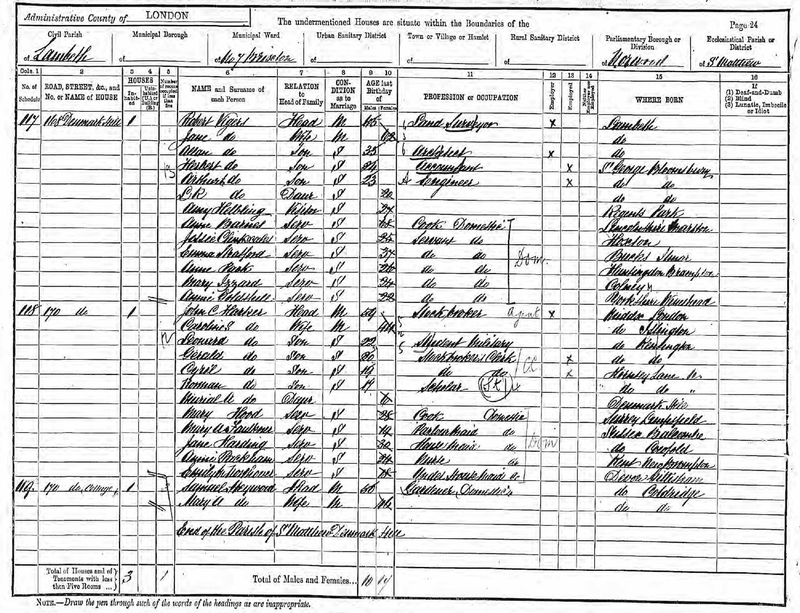 Meanwhile their brother, James Alexander, appeared on the 1851 census aged 39, an attorney, living at Mayfields Road in Hackney with his wife Sophia and their five children. A year later both parents would be dead. 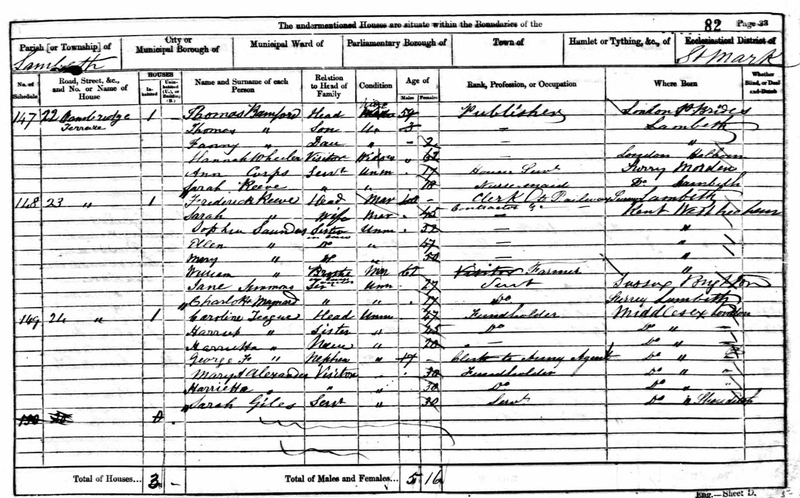 On the 1861 census the two sisters Caroline (47) and Harriet (45) are still at Lambeth but they now have living with them their niece Harriette [Sophia] (20) and nephew George [Fletcher] (17) as their parents had died in 1852. No longer showing up is Sophia Teague who died in July 1851. There are two visitors Margaret Alexander and Harriette Alexander; no doubt related to Caroline and Harriet’s mother Sophia Ann Alexander. 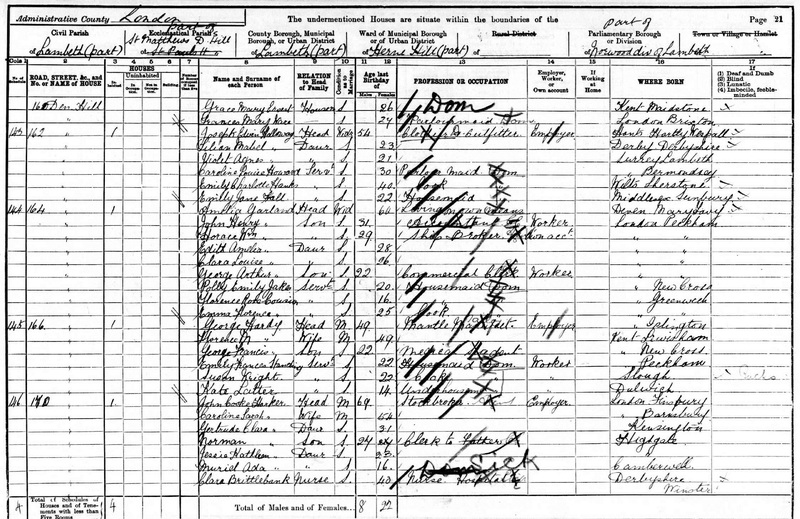 On the 1871 census, the two sisters Caroline (aged 56) and Harriet Teague (54) are living (on their own means) at 19 Hilldrop Road in Finsbury, North London with their niece Harriet Sophia (31) and nephew George Fletcher Teague (27) and also with a cook and housemaid. Next door at No. 20 is a household headed by John Sheldrick (46) a leather seller, his wife Eliza (40) and daughter also Eiza (14). There is a visitor Louisa Hacker (38). Eventually George Teague and Eliza Sheldrick would marry. On 6 February 1880 Harriette Sophia, the daughter of James Alexander and Harriette (Fletcher) Teague, died. 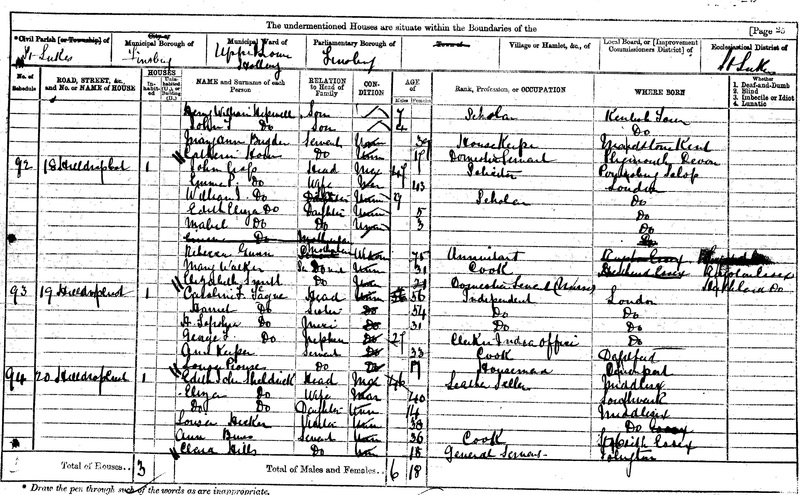 On the 1881 census the sisters Caroline (67) and Harriet (65) continue living at 19 Hilldrop Road with their 37 year old unmarried nephew George who is a civil servant in the India Office. There are three visitors Eliza, Ethel, and Edith Julius and two servants. 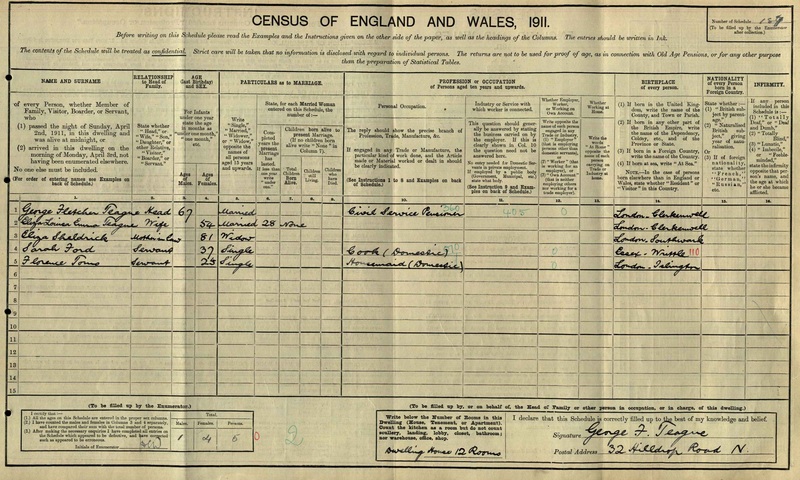 On the 1891 census sisters Caroline (77) and Harriet (75) are still living on their own means but they have moved to 9 Hillmarten Road; their nephew George (49) is living with them along with his wife Eliza [Sheldrick] (34). There is one nurse attendant and three servants. The Sheldricks, who lived next door on the 1871 census, are no more. 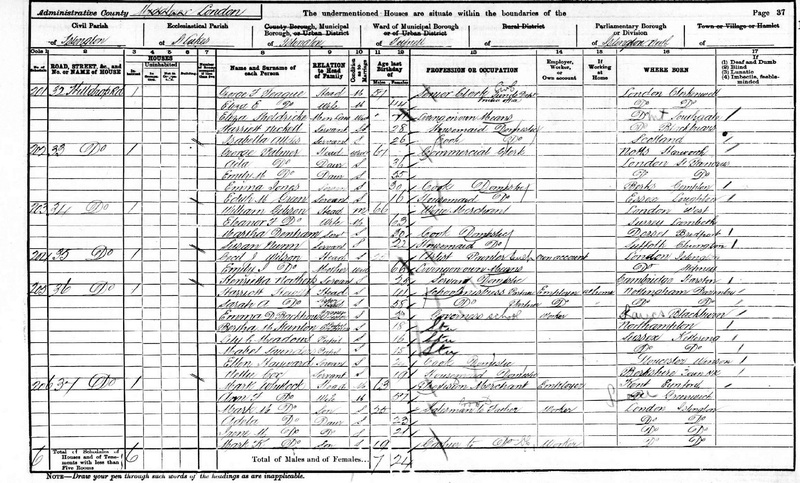 By the time the 1901 census is taken the Teague aunts have deceased and their nephew George (57) is now the head of the household with his wife Eliza and her mother the widowed Eliza Sheldrick and two servants. George is now a senior civil servant at the India Office. Not much has changed between 1901 and 1911. George and Eliza have been married 28 years and George is retired. His widowed 81 year old mother in law is still living with them. Sophia Caroline Teague, the daughter of James Alexander and Harriette (Fletcher) Teague, marrried John Cooke Harker. John was born on 22 August 1831 and was baptised on 11 November 1831 at St Stephen, Coleman Street, London. His father was John William Harker and mother Eleanor [FHL 0375014, 0375017]. A record for Caroline Sophia (Teague) Harker’s death is registered in June 1929 aged 84 at Chelsea.